Fr. Robert Barron has some interesting comments on the books by the two brothers, one an atheist, one a former atheist. Does Academic Freedom Apply to Christians? Mounce: What Makes a Translation Accurate? Papal Trip Day 1: "A Roaring Success"
Did the Pope Cover Up Abuse? No! Benedict vs. 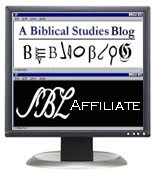 The "Dictatorship of Relativism"
Around the Blogosphere. . .